When when working with women clients who are thinking about becoming pregnant (preconception), or are in their first trimester (conception – 12 weeks), there are some things to consider when designing workouts. -Not the time to be training for major competition, marathon, etc. –Education on early pregnancy and the changes her body will go through. – This is where Pilates comes in as the perfect addition or transition to an already established routine. Ex: Pre-Pilates, Pilates on the equipment, in addition to her regular cardiovascular activity. -NOT the time for rapid increases in exercise, an all-out sustained effort, for high-altitude training, or middle to long-distance competitive events. – anovulation, dehydration, hyperthermia, and hypoglycemia. Adding Pilates to a competitive athlete’s regimen, swapping out a few days of regular training with Pilates sessions, will allow for a safer, yet challenging activity. *Generally, it is recommended that pregnant women don’t start any new activity until the pregnancy is well established, in the 2nd trimester, at 12-14 weeks. If your established client becomes pregnant, it is usually safe to continue with the activity she has done. Again, make sure she has checked with her doctor/birthing professional. 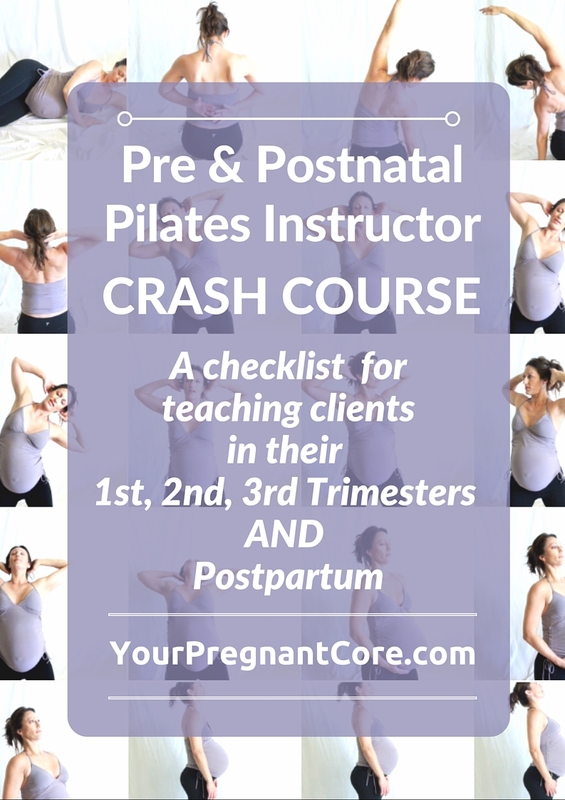 If you haven’t done so yet, please pick up my complimentary PDF Pre & Postnatal Pilates Instructor Crash Course PDF where I outline how to engage the core during pregnancy.